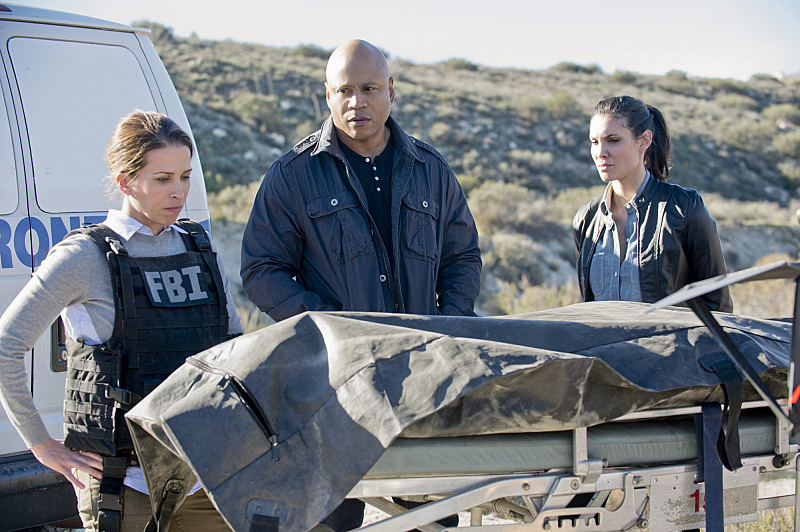 Pictured: Christina Cox (FBI Agent Allison Conway), LL COOL J (Special Agent Sam Hanna) and Daniela Ruah (Special Agent Kensi Blye). When three FBI agents are killed in an explosion following a successful undercover sting operation, the team searches for the person behind the attack. Also, Deeks and Kensi realize the team knows about their relationship and Hetty pairs Kensi with Sam and Deeks with Callen during the investigation, on NCIS: LOS ANGELES, Monday, March 23 (10:00-11:00 PM, ET/PT) on the CBS Television Network. Photo: Neil Jacobs/CBS ©2015 CBS Broadcasting, Inc. All Rights Reserved.